Cairns, the major tourist destination of Queensland, Australia's Tropical North is the ideal location for exploring the Great Barrier Reef. 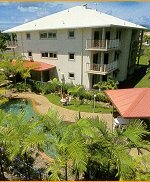 Many of the international hotel groups and apartments operators have properties in Cairns, including Hilton, Holiday Inn, Ramada and Radisson. Local chains represented include Rydges, Metro Hospitality Group and Country Comfort.